It's friday so you all know what that means right? Today (Shaina) Minty from from Haute Lacquer prepared something really beautiful and special for us =). Hi everyone! First I want to thank Dolores for inviting me to do this post! I am so flattered and excited to be writing on this blog. I was so indecisive about what to do with this post. I thought of so many different things and even drew some nail art ideas. But then I lost the sheet and just grabbed some tape and scissors and just went at it! I love tape manicures because they are so easy to do and work with. After several attempts and color combinations, this is what I came up with. For this manicure I used S-he 471 as the light blue/silver metallic base. I let it completely dry before I cut out thin strips of regular scotch tape and placed it on my nails, overlapping each piece of tape I put down. 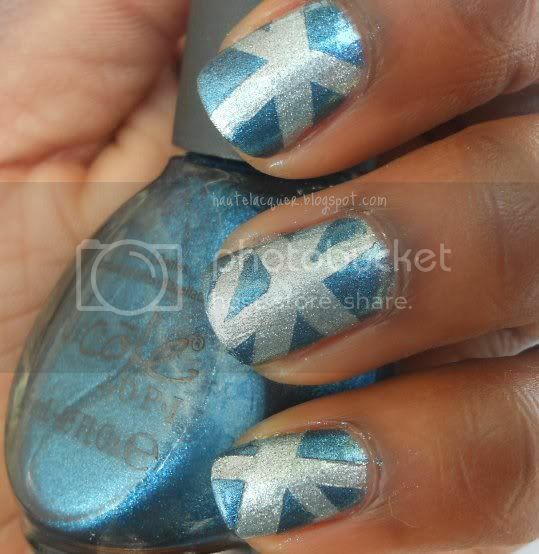 Then I applied a medium blue metallic, Nicole by OPI Party in the Penthouse, over the entire nail. I carefully removed the tape, making sure to remove the pieces I laid on top first. Finish off with a topcoat and you're done! I hope you all enjoyed my post, I am so happy to have written it! Thank you again Dolores. Isn't it gougers? 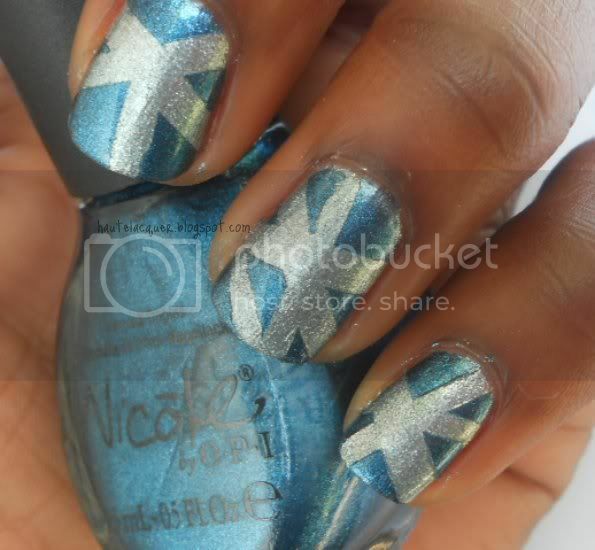 I'm definitely making a scotch tape manicure soon =). Would you like to participate in guest nails? Just write me mail on dolores dot zimerl at gmail dot com. That is great. I have to cut the tape so thin on my short nails though! Very cool! I'm gonna have to try a tape mani one of these days! Such a lovely nail paint treatment there is. Like this blog, also found so many types in the profile picture. OMG! That looks so nice!